We are currently about 60 minutes south-east of Nashville at Yellow Bird, a lovely “art farm” in the process of becoming a retreat center. Yes, exactly, it is right up our alley! David Wood, the director of Yellow Bird is a vegetarian and crafted such wonderful meals the first few days that JC made nary a whisper about taking a meat enhanced meal or two in the Schwartz. However, on the third day came the: “You’ll cook tonight?” I knew I had to come up with something really stellar – both delicious and hearty. I had spied a box of quinoa on the fridge and even though JC doesn’t really like quinoa, it just stuck. I thought burgers might do the trick so I turned to Martha. And epicurious.com. And a few others. To make matters a little more complicated, I’ve decided to try going gluten-free for a while to see if that helps my minor thyroid condition. (Read this very interesting article about thyroid, diet and exercise.) All of the recipes I researched called for either bread crumbs or flour. I think the gluten helps the burgers stick together so I substituted beans, sorghum flour and flax meal and guess what? The quinoa burgers turned out great! Even JC was super impressed! If you make these, let me know how it goes! 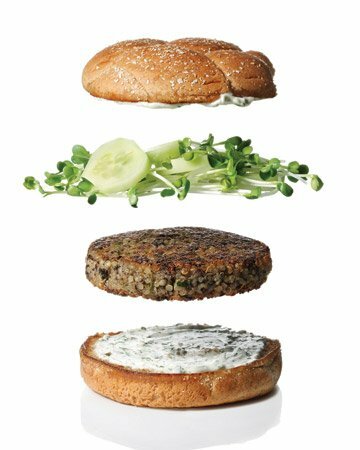 COOK’S NOTE: These patties are softer than a traditional veggie burger. 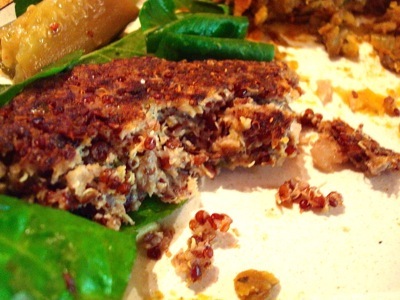 The pan-searing helps the quinoa burger hold together and forms a crisp crust. Finely chop mushrooms or chop in a food processer and transfer to a bowl. Stir in egg, cheese, flour and flax meal. Mash again. Cover, and refrigerate until cold and firm, about 1 hour. Heat remaining 2 tablespoons oil in a large nonstick skillet over medium heat. Shape mixture into six 1/2-inch-thick patties, pressing firmly. Cook in batches until golden brown and cooked through, about 3 minutes per side. You can serve these on hamburger buns like a regular burger with mustard, mayo, relish, tomato, pickles, onion, or cheese or you can have it on a bed of greens like I did. For some reason, these are especially nice with a hearty green like chard or kale dressed simply in salt, pepper and apple cider vinegar and thick slices of real tomatoes. Wipe pan clean, and return to medium heat. Brush cut sides of buns with oil, and heat buns, cut sides down, until toasted, about 1 minute. Combine yogurt, parsley, capers, garlic, and salt in a medium bowl. Season with pepper. Cover, and refrigerate for up to 1 day.